This sweet and spicy Slow-Cooker Pumpkin Chili is a gameday winner and all-around crowd pleaser! There are about as many opinions about how chili is supposed to be made as there are hairs on your head. Some like it hot, some not. Some like beans, some prefer to leave them out. I, personally, like my chili really thick and meaty. I like the flavors to be complex with a little heat but not so much that I can’t feel my tongue. 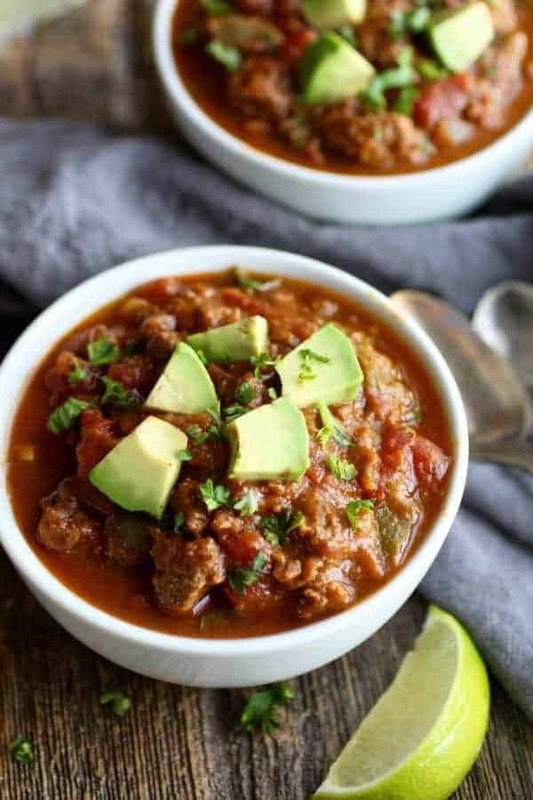 I also like it to be convenient and I love having leftovers for the next day – which if there is anything we can all agree upon when it comes to chili it’s probably those last two things – convenience and leftovers. This Slow-cooker Pumpkin Chili is all that and more. What makes it particularly amazing is that you get to hide extra vegetables in it. In addition to the usual tomatoes, onions, peppers and garlic there’s pumpkin – a great source of vitamin A, fiber and some healthy carbohydrates. Anytime I can hide extra vegetables in a dish I’m #winning at this mom thing. My kids beg for this stuff because it’s only slightly spicy and the pumpkin makes it naturally sweet. It also packs well in a preheated thermos to send in their lunch boxes. 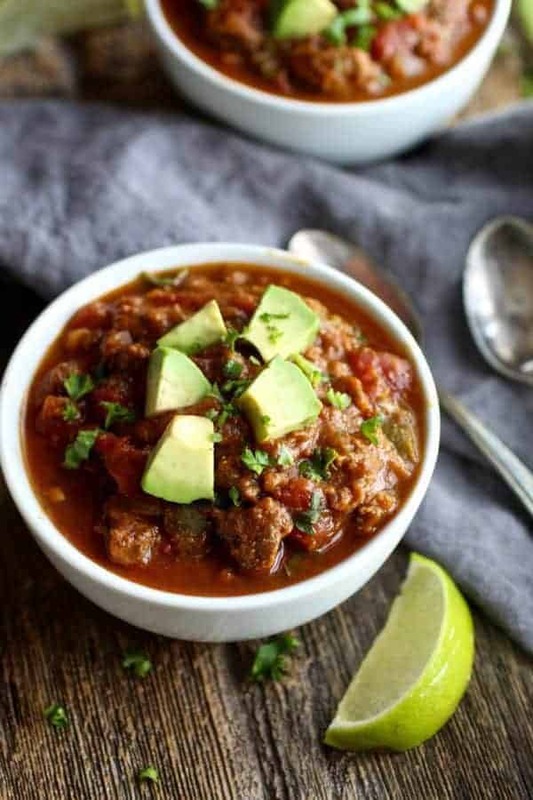 Whenever I do a Whole30 I make a double batch of this chili because I get really hungry (like man-sized appetite hungry) in the first week or two and nothing beats that hunger like a big bowl of meaty chili made with grass-fed ground beef and topped with creamy avocado. And it freezes beautifully so I portion it out into pint-sized mason jars and freeze for future meals when I need something Whole30-friendly and everyone else wants homemade pizza. 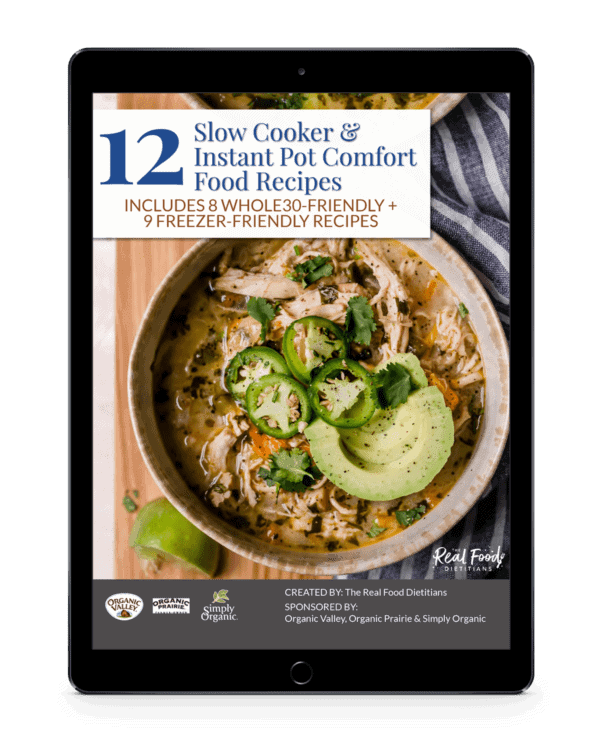 Slow-cooker meals are perfect for weekdays because there are few things better than walking in the door after a long day at work to a hot meal waiting. Just add a salad and you’re set! Weekends are great for slow-cooking when you want to get out and play and have a meal to come home to. I’m famous for getting up super early on powder days to get something in the slow-cooker so we can ski all day without having to worry about making dinner. I’ll do whatever is takes to get in one more run. Chili and football are pretty much synonymous from what I hear (I am not a football fan whatsoever. Not even a little.) 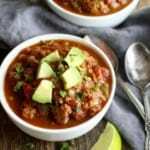 But I love a good tailgating party and chilly fall days and holding a bowl of warm and spicy chili up to my half-frozen face and taking a deep breath – inhaling the sweet smell of cinnamon, the spicy chili powder and the fresh lime and cilantro this Slow-cooker Pumpkin Chili has to offer. Slow-cooker Pumpkin Chili is one of those foods that makes you want to just crawl into the bowl. Make you all warm and cozy on a blustery day! 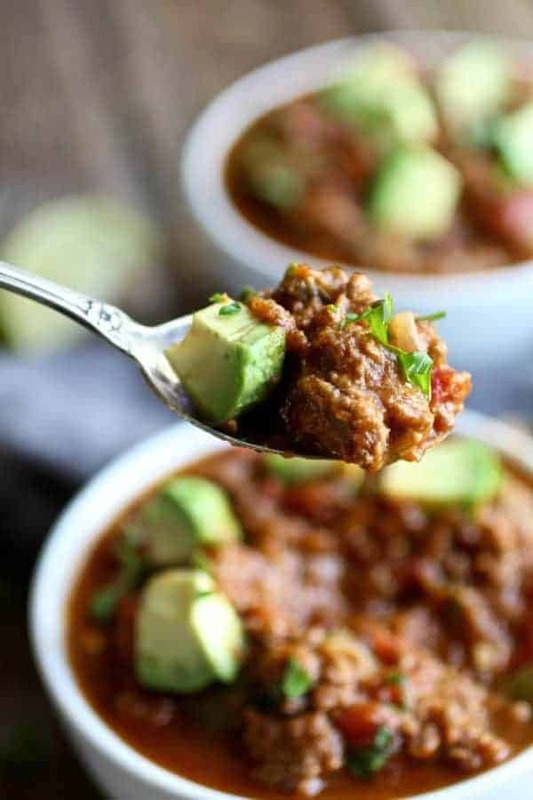 This hearty beanless chili is a crowd pleaser – and it’s Whole30-friendly! The pumpkin adds a touch of sweetness, fiber, and vitamin A and it’s a great way to sneak more veggies into your diet. Feel free to spice it up by adding more chili powder, jalapenos or cayenne pepper if you like it spicy. Heat a large pot or Dutch oven over medium-high heat. Add oil and saute the onions and peppers, stirring occasionally, for about 7 minutes or until onions start to soften. Add the garlic and cook an additional 30 seconds or until fragrant. Add the ground beef. Use a spatula or large spoon to break it up as it cooks. Cook until meat is nearly cooked through, about 8-10 minutes. Transfer meat mixture to the slow cooker. Set heat to LOW and cook for 6-7 hours. Serve with desired toppings. 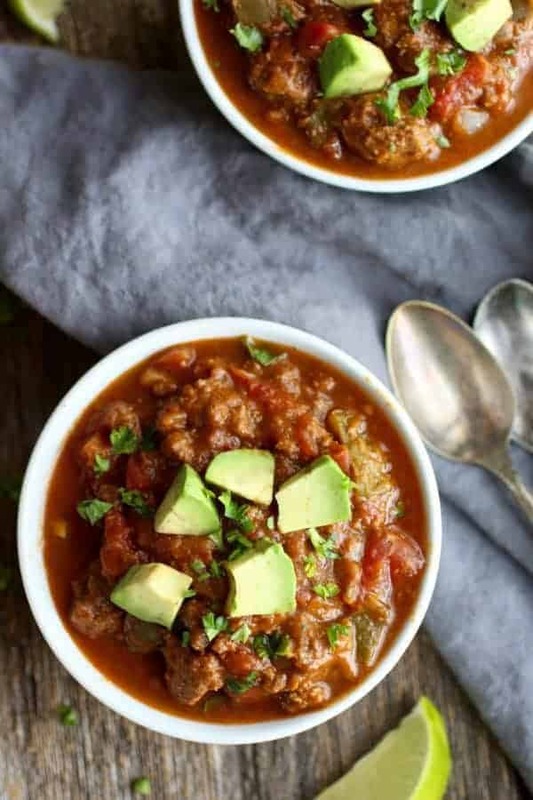 It’s great if you’re a hearty chili lover. I often prepare it up through Step 5 then put it in a container in the fridge (or you can put the slow cooker insert right into the fridge if yours is removable) – then I pop it all into the slow cooker in the morning and come home to awesomeness in a bowl. Happy cooking and thanks for commenting! What do you top yours with if anything? Hey Melissa! I put a big handful of fresh spinach in my bowl then add the chili. Then I top it with lots of fresh cilantro, lime juice and avocado. Hubby and the kids like cheese and sour cream in theirs! On the menu! Excited and hope the family likes it! Thanks for the tip. I haven’t made it yet, but just came back to make a list of all ingredients needed. I was curious though on one thing. In your steps; you show “1/2 – 1 Cup Chicken Broth or Water.” Does that mean 1/2 a cup or do you just mean you may need anywhere from 1/2 cup to a full cup of the broth? Thanks in advance! Yes, there is a range 1/2 – 1 cup of broth or water. How much you use will depend on how thick you like your chili and how much liquid was in your diced tomatoes, etc. Fantastic! Can’t wait to hear your thoughts. This looks delish! Can’t wait to try it. Thanks. 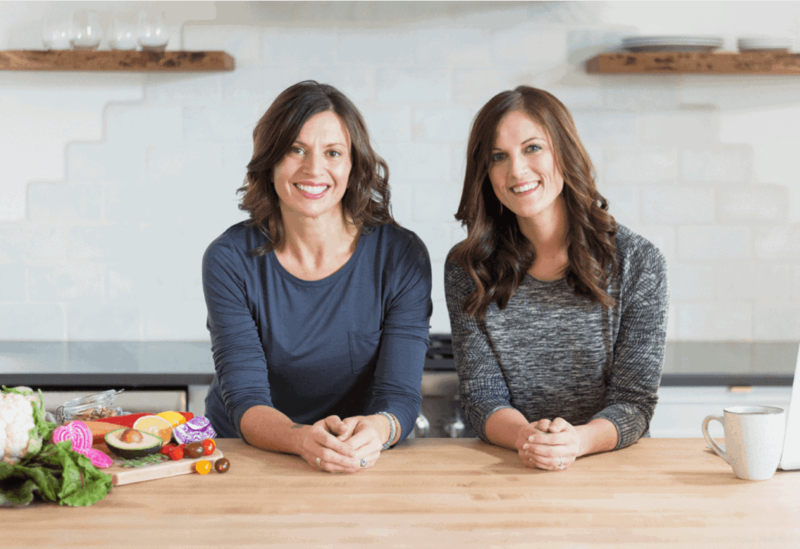 I hope you enjoy it – we’d love to hear what you thought of the recipe. I tried it today. It taste kinda bland. What do you think I should add? I can’t take the spicy nor the sweet. I’m wondering where I went wrong.. Thanks for your question. It sounds like your tastes require a bit more spice so I’d suggest adding more chili powder or even some cayenne pepper. As for the sweet, this recipe isn’t meant to be overtly sweet – just subtly sweet from the pumpkin. However, you can certainly add a tablespoon or two of honey if you’d like yours sweeter. This recipe is really low on salt. Add more salt and you’ll get more flavor, that’s all it needs. This sounds delicious! Do you think some butternut squash would go well in it? I think so! Give it a try and let us know how it turns out! This was delicious!! I used chipotle chili powder (my current fave) and fresh ground cumin. The house smelled like autumn!! Thank you for developing and sharing this recipe! We love this kind of feedback and so great to hear you enjoyed this recipe! Chipotle Chili Powder sounds so good – I’ll have to try that next time I make the chili! I would like to try this with kidney and pinto beans added – would I need to add more liquid? Yes, you would likely need more liquid as the beans will soa k up quite a bit (and this chili is naturally thick). I made this last weekend as part of my batch cooking for the week ahead, and it was perfect for work lunches all week! It tasted kind of bland though – basically just of tomatoes and beef; I couldn’t taste the pumpkin or any of the veggies or spices even though I followed the recipe exactly. Is there anything I could do to enhance the flavors next time I make it? Thanks for trying the recipe. The pumpkin shouldn’t have a pronounced pumpkin flavor – it’s there to add body, vitamin A, fiber and a bit of natural sweetness to compliment the chili powder. 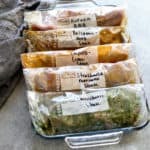 Certainly we all have different thresholds for flavor when it comes to spice, so tasting and adjusting the level of spice is always encouraged. Because spices start to lose their potency immediately after they’re ground, we recommend that you use spices within 6 months of opening them for best results. Buying spices in bulk is a great way to get fresher spices. I hope that helps and that you give the recipe a try again. I’ve made this a couple of times now, and really enjoy it with the following substitution: instead of a 28 oz. can of diced tomatoes, I use a 14.5 oz can of diced tomatos and a 12-16 oz jar of salsa. It adds some of the heat I like, along with some extra flavor. 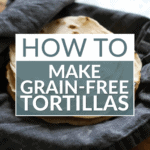 Glad to hear you enjoy this recipe – your substitutions are great – thanks for sharing! I love this recipe! I add 5 cups of cubed sweet potato and it lasts us the weekend. We love this recipe and the addition of sweet potatoes sounds fabulous. Thanks for sharing! Having this for lunch right now and loving it! I adjusted the cooking instructions to simmer on my stove-top instead of the crock post and it turned out lovely. Thank you for sharing! Isn’t it so delish!? So happy to hear you love this recipe. It’s one of our faves! And good to know your stove-top version worked well for you! Your recipe sounds delicious! I am not able to eat the canned tomatoes and tomato paste. 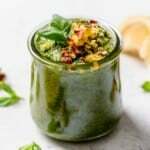 Do you have any suggestions for a substitution or modification of the recipe? Made this last night and my husband LOVED it! Added a can of black beans and some chili flakes for some heat. After sitting in the crockpot, the heat was mellowed but certainly still there. Also, swapped 1 Tbl of chili powder for Ancho Chili Powder. Thank you for a winner! You addition of ancho chili powder and red pepper flakes sounds amazing! I’m a sucker for hot and smokey chili! Has anyone made this with cubed chicken? It looks delicious. I’m so glad you decided to revisit this recipe and share it again. I’ve never made it, but I’m going to as soon as I can. I love to cook once and eat two, or even three times! I also love that it is able to be frozen and pulled out just when you need it again. Yes! We love recipes that you can reheat and enjoy a second or third time. Hope you enjoyed our Pumpkin Chili. It’s one of our faves. I didn’t measure the servings themselves but it did serve 4 for dinner + enough for 2 for lunch the next day. If my memory serves me right, it was about 1 ½ cups per serving. Sorry I couldn’t give you a more exact answer. To make it vegetarian, can I put a can of beans in stead of meat? 2 cans or 1 of beans? You could certainly use beans. However, I’m not sure how many cans you’d need – I guess that would depend on how ‘beany’ you’d like it to be. I’d suggest starting with 1-2 cans of beans drained and rinsed then see if you need more. Hi Jessica and Stacie! I’m so glad I found you through Whole30 recipes on IG. 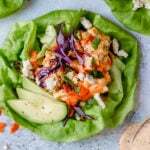 Everything you share is so delicious, and your helpful tips have really saved me as I navigate my way through this (new to me) world of Whole30 awesomeness! Thank you for your kind words – we’re so glad you found us and that our recipes are making your Whole30 easier. When I double the recipe I put it all in the crockpot and cook it all at once. It makes a big batch so you’re crockpot is going to be pretty full but it’s doable. I’m having so much fun trying your recipes and this chilli was a huge hit! I read the comments about being bland so I was generous in adding the spices (letting it spill over my measuring spoon) added 2 small red chilli peppers and my husband insisted on 1 tablespoon of salt after taste testing. We added 1/2 cup broth only as we didn’t want it to be too liquidy. We left it on low in slow cooker all day and helped ourselves. I did grate some sharp cheddar cheese on mine which was delicious. Can’t wait to try this! Could you cook it on high for 4 hours? This is in the crockpot now. I used ground turkey because of a sale. It smells fabulous. Can’t wait to try it and see what my first grader thinks. 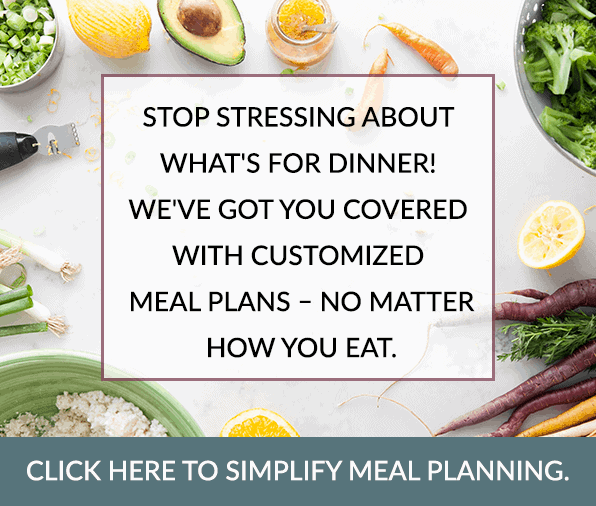 Ground turkey is actually what I used when I created the recipe years ago but then after getting a whole grass-fed beef one year we switched to beef and that’s stuck – so really, either meat works well (as does ground bison). Hope your little one loved it! Delicious! I subbed in kidney beans, canalini beans, and sweet potatoes for the meat. Our slow cooker stopped working so I left this on a low simmer, stove stop. Perfect chili texture. Those sound like great substitutions. Thanks for sharing! Sounds delicious! Can we make this in the Instant Pot instead? How long would you suggest cooking it on high pressure for? Thank you for your kind words – so glad you loved it. Yes, you can make it in the Instant Pot by browning the ground beef, peppers and onions in the pot using the Saute function then adding the remaining ingredients and selecting the ‘Soup/Chili’ function. You may need to decrease the liquid (broth) a bit since you won’t have any evaporative loss of liquid like you do with the slow cooker. Hope that helps! This is absolutely delicious. I am on Whole30 and was pleased that it was as tasty as it was. I do love pumpkin but I was a little skeptical with pumpkin in chili? I could not taste the pumpkin at all…. what it did was make it a very hearty meal. I will definitely be making this again !!!!!! We love hearing this – so glad you loved it! Here’s a tip: during the halloween season, you can make some pumpkin puree to store away in the freezer and use later to make the chili. Cut a pumpkin in half, clean out the pulp and seeds, then put the pumpkin halves onto a baking tray sprayed with cooking spray. Bake it at 350 degrees between 40 minutes to an hour. Scoop the baked pumpkin pulp into a bowl, then mash it with a potato masher into a puree. Freeze the puree for future use. I’ve used this puree to make pumpkin pies, and this will also work for pumpkin chili and other pumpkin recipes. Hey! Thanks so much for the great tip! I love having extra pumpkin at the ready for cooking. Where are the beans?? Chili needs beans in my opinion Also what is satured fats? Need breakdown on that. Also Ill be using 99% gat free ground turkey and beans. Am on weight watchersso using ff turkey and adding beans which will greatly reduce the points. Thats why need saturated fats to convert for points. Changes will increase fiber, protein and lessen fat. Instead of 11 points it will 1 point. Can use very lean ground beef too and it would be 5 points. 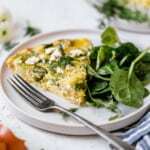 Feel free to use a free online nutrition calculator such as My Fitness Pal to calculate the saturated fat (the amount of which will change per serving if you add beans). This was a hit with my family. They were skeptical about the pumpkin but it added such a flavor enhancement. I used beef broth instead of chicken and also a can of hot Rotel to give it some heat. This will be a fall soup for us every year! I’m so glad you took a chance on this one – it’s one of my favorites too. The pumpkin lends a subtle sweetness and plays well against the chili spices. Enjoy and Happy Fall! 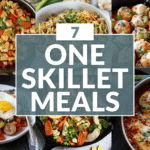 Do you have an instant pot variations for this recipe? 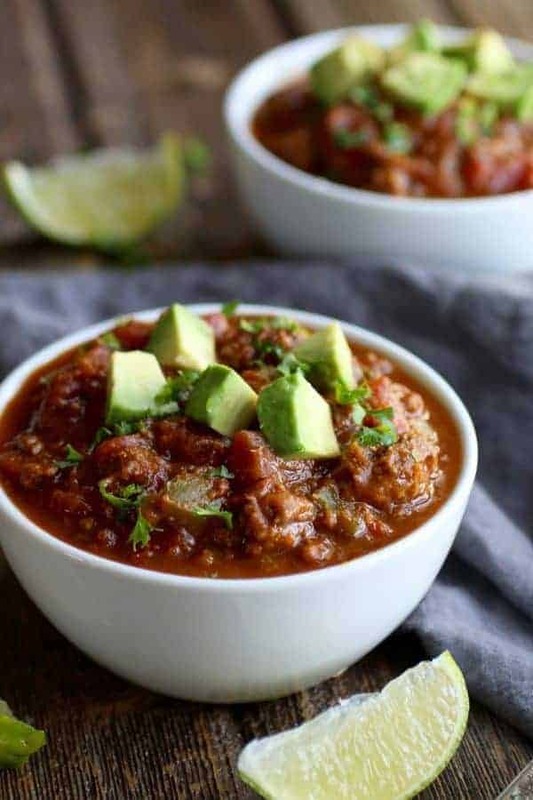 Stacie recently tried this recipe in her Instant Pot and used the ‘Chili’ setting (30 minutes) and it turned out great for her. Of course, you’ll want to use the ‘Saute’ function to brown the meat, onions and peppers before adding the rest of the ingredients in the recipe. Loved this Chili. I read everyones comments. So i did the 14.5 oz of tomatoes and 12 oz of salsa. I also did almost 1 tbs of salt and added a few chipotle peppers as well as sweet corn to the recipe. I like spice but the other flavors balance it out so there is also some sweet. I did it in the insta pot on the chili setting, but kept getting the burn message. I ended up having to do the full cup of chicken broth to get past this. So great to hear you loved this chili, it’s one of my faves. Also, thanks for taking the time to share your feedback and what you changed. Super helpful! Delicious! Mild enough for everyone in my family, although my child who lives spice added more to his bowl. Great freezer meal. Great to hear that this recipe was a winner for the entire fam! I’ve made this several times now; it’s a new family favorite! I modify it by substituting ground turkey for the beef sometimes and I always round it out to a ful two pounds of meat. I also add a second can of pumpkin and a little bit of cayanne pepper for a tiny kick. Mmmmmmmm!!! That is so great to hear!! Thanks for sharing!